A bedroom for many is their favorite room and is a place where they find the most comfort and relaxation. A bedroom should be a place where one can unwind and relax at the end of a hard day. Unfortunately, a cramped bedroom isn’t conducive to relaxation or a good night’s sleep. If you want a relaxed atmosphere in your small bedroom, then it is very important to make the best use of the limited space you have. To do this, it is important to find the right furniture for small bedrooms. When we say the right furniture, we mean furniture that will provide the most usefulness, with the smallest footprint. Smaller sized furniture is an obvious choice, however, multi-purpose furniture is the smartest choice. A piece of furniture that provides two or more uses, is absolutely ideal for small bedrooms and is something we rave about a lot on Best for Small Spaces. In this article, ‘ideal furniture for small bedrooms’, we will be suggesting some of our favorite types of bedroom furniture and we hope you get some ideas on which furniture will help maximize the space you have in your small bedroom. The focal point of any bedroom is the humble bed. A bed will also take up the most space in a small bedroom, therefore finding the right size bed for your room is important. However, there are different types of beds that will help maximize the space you have in your small bedroom. Here is a list of beds with a variety of features and how they can be a great option for your small bedroom. A bunk bed is a fantastic option for families with more than one child. A bunk bed’s greatest asset to a small bedroom is using the upper space of a room. Bedroom space becomes cluttered on the ground, not by the ceiling. Two twin sized beds will take up the majority of even a large room, therefore by having one bed on top of the other, the same footprint is used for two beds, as it is for one. Bunk beds come in all different sizes, for example, a single on top of a double, or even a triple bunk bed where three beds are on top of each other. To see some of the different styles of bunk beds, click on the link. Loft beds are similar to bunk beds, except they don’t have the bottom bunk. A loft bed is like a bed on stilts. A loft bed is great for small bedrooms because once again, it uses the upper part of a room, freeing up space on the ground. A loft bed is a really cool looking piece of bedroom furniture and we love them. We feel that a loft bed is an ideal bed for teenagers or college students because a study area can be set up right under the bed. Have a look at these different types of Loft Beds for Small Rooms, to see if they might be something that would interest you. Cabin beds are similar to loft beds, however, instead of having free space underneath the loft bed, there is already furniture attached underneath. A cabin bed is pretty much like a complete room in a room. Depending on the style, a basic cabin bed can have several storage compartments under the bed or a luxurious cabin bed can have a desk compartment, bookcase, chest of drawers and even a slide out bed, all under a twin size bed. A cabin bed is a wonderful piece of multi functional furniture for a child’s room and is one of the best choices for a small bedroom. To see some children’s cabin bed reviews, click here. A trundle bed is normally a bed on wheels that can be rolled in and out from under another bed or sofa. A trundle bed is an ideal bed for studio apartments or used as a guest bed. The beauty of a trundle bed is how it can be stored away out of sight, when not needed. For example, a person living in a small studio apartment may have a couch on legs with a trundle bed underneath it. During the day the couch is all that can be seen, however at night, a ready made bed can be wheeled out to sleep on. Trundle beds can also come attached underneath other beds and are wonderful extra beds for stay over guests. Trundle beds are a great space saving solution for small rooms, therefore take a look at these trundle beds for small spaces, to see what different types are available. Any furniture that can be folded up is a space saver and should definitely be considered for s small bedroom. We believe a folding bed is an excellent idea for really small apartments or tiny rooms and also an ideal hideaway guest bed. Folding beds can be folded up to as little as 6″ thick and stored in closets or under beds. They usually come with wheels, so are very mobile. A folding bed may not sound like the most luxurious type of bed, however they are super convenient and very useful as an extra bed. To find out more about this type of bed, have a look at this article on fold up beds. Sofa beds are becoming more and more popular these days as more and more people are living in smaller homes. A positive result of this is that the quality of sofa beds has improved a lot, making sleeping on a sofa bed a luxury rather than a chore. Sleeping on a sofa used to guarantee waking up with a painful neck or back, however, nowadays a sofa bed is a premium style dual purpose piece of furniture. A modern sofa bed has a bed hidden inside the sofa, so when it’s time to sleep, you can pull out the bed and have a real mattress and bed frame ready to sleep on. We love sofa beds and believe they are a wonderful choice for small studio apartments. A sofa bed frees up space during the daytime, making a small apartment a lot less cramped during the day. Sofa beds are also great makeshift guest beds and very handy to have available. 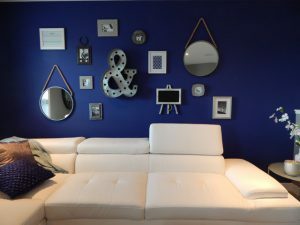 Why not have a look at some examples of high quality sofa beds on our best sofa beds for small spaces post. And finally, our last space saving bed option is a daybed. A daybed may seem similar to a sofa bed, however there is a little difference. A day bed is a multi purpose couch, lounger and sleeper chair all in one, similar to a sofa bed, however a daybed’s seating area is a real mattress. Therefore, not only is it even more comfortable to sit on, but it also is a ready to sleep on bed. Daybeds are normally twin size and are great for small apartments or as a comfortable guest bed. We also recommend a daybed for a small office as a comfortable seating area and a place to sleep on late nights at the office. Click on the link to have a look at these great looking day beds for small spaces. As you can see, there are many different types of beds to choose from. Who would of thought there were so many styles of beds, that are ideal for small bedrooms and small homes. Wardrobes are another bulky item that can take up a lot of space in a bedroom. We can’t buy a fold up wardrobe and we can’t store a wardrobe under a bed, so how can we make the best use of a wardrobe in a small bedroom? Narrow and high is the answer. A tall, narrow wardrobe is the best fit for small spaces because it will slot in better than a wide wardrobe. Finding good quality, narrow wardrobes is not the easiest of tasks, however we have found some narrow wardrobes and wardrobe alternatives in another article, wardrobes for small bedrooms. There you can find narrow wardrobes, closets and alternative clothes organizers that may be a nice addition to your small bedroom. A nightstand may seem like a luxury item to have in a small bedroom because they might be a tight squeeze between the bed and the wall. 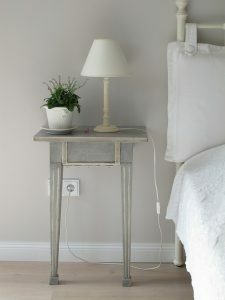 However, we feel that this is a pity because nightstands can add a lot to the appearance of a bedroom. The best way to fit a nightstand into your small bedroom is to get a small, narrow nightstand. Simple as that. There are plenty of narrow nightstands to choose from and in many different designs. We had to narrow our favorite small nightstands down to 15, which means you will have plenty to choose from. A dresser, just like a wardrobe can be a bulky item, taking up valuable space in a small home. Once more, the best way to fit this piece of furniture into your room is to go narrow and go tall. Dressers are not only great as a storage solution but also as a way to keep things organized. And if one place needs to be kept organized, it is a small bedroom. A tall and narrow dresser can slot nicely into an available space or a vacant corner. We like dressers with 5 or 6 drawers, especially the ones that are singular and stacked upwards. Have a look at this article on our top 5 small dressers for small spaces, to see some different styles of dressers that may fit nicely into a vacant corner in your bedroom. 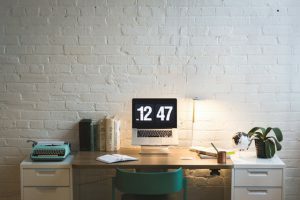 Whether you live in a small dorm room, have a home office or need to study in a small bedroom, a computer desk is an essential piece of furniture to have. The choice of computer desks these days is amazing and they come in all different sizes and designs. Of course we recommend a small size, however we also recommend you pay attention to what other features it offers. For example, a pullout keyboard will allow you to buy a narrower desk. A computer desk with storage shelves will allow you to organize your study/work area better, which will help de-clutter a small room. Or how about a floating desk that can be attached to a wall and will take up a fraction of the space a regular size computer desk will. There are a variety of desks to choose from that will look great in a small bedroom, therefore why not check out our top 8 small computer desks for small spaces, to give you a better idea of which styles we recommend for a small room. Are vanity tables a necessity in a small bedroom? Do we really need a vanity table in a small apartment? Why not. Vanity tables may be a luxury item, however, they are super handy tables for organizing beauty products and allowing you to get ready in more comfort and style. In our search for the perfect vanity table for a small bedroom, we found some great designs and some great makeup tables for storage and appearance. Whether you like the modern, chic style or the royal, princess style, there are several vanity tables to chose from that will easily slot into a small available space in your bedroom. Have a look at these small vanity tables to see which type will be perfect for your small bedroom. So there it is. Several types of furniture that any bedroom needs. 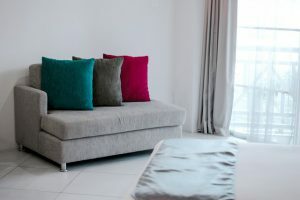 By picking and choosing the pieces of furniture you need the most from this list, you can make the most of the limited space you have in your small room. 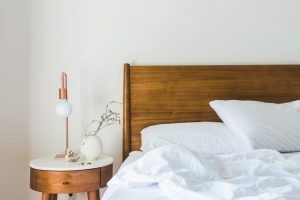 We hope you got some ideas in this article, ‘Ideal Furniture for Small Bedrooms’, and we hope that you were able to find the perfect piece of furniture for your small bedroom.